Martha Stewart has shared everything from paint colors to pasta salad recipes with her adoring fans. Now the expert on everyday living has created a wedding invitation collection with paper monolith Crane & Co. It’s not too surprising that the release, which was one of the brightest spots on the show floor at NSS 2009, also puts a distinctive, Martha Stewart-esque spin on the way invitations are shopped. According to Megan Kuntze, brand director, Crane & Co., some consumers told them that ordering from large albums could be overwhelming. So boxes filled with samples to touch and feel are sent to participating stationers, who may order an extra set to mount on boards or in a small notebook. There’s also a 35-page lookbook for brides to take home and swoon over where the visual approach is more in keeping with a Martha Stewart Weddings magazine layout than a typical album. Stationery Trends caught up with Martha Stewart — who coincidentally appeared in Crane & Co. advertising campaign during her modeling days — to learn more about this most special offering. ST: The question is not so much why you developed an invitation line, but what took you so long? MS: I have wanted to develop a stationery line for a very long time, but good things can’t be rushed! ST: With so many invitation lines available, what did you try to put into yours design-wise to make it stand out? MS: As with all our merchandise offerings, our goal is to design products that are beautiful and distinctive. To that end, our collection with Crane & Co. features new calligraphic motifs and flourishes, decorative scrollwork, embroidery-inspired designs and hand-engraved details. Couples can customize their designs through engraving, thermography, letterpress, lithography and foil stamping. I’m also very proud that our collection includes papers that are tree-free, 100 percent cotton or contain post-consumer recycled content and are FSC- or Green Seal-certified. ST: How would you say the line expands your brand in paper form? MS: In our magazines, and on our TV and radio shows and Web sites, we help consumers plan special occasions from birthdays and showers to holiday gatherings and weddings. 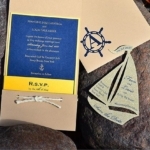 Social stationery is a natural extension of our established presence in entertaining and weddings. ST: Can you describe the design process? MS: We developed our designs over the course of several months, working closely with Crane’s engraving and letterpress experts to ensure that our designs not only met our high standards but could be readily reproduced. For our designs, we drew on a myriad of sources, the first and most important being Martha Stewart Weddings magazine. Our art department has been creating unique wedding invitation designs for the magazine for 15 years so we had a rich archive of original ideas at our fingertips. We also found inspiration in everything from the delicate colors of eggs from my Araucana hens and Wedgwood china to old-fashioned calligraphy, which we re-interpreted with a modern twist. ST: We love that your range offers engraved, thermographed, flat-printed, letterpressed and foil-stamped options. How did you decide which design would receive which treatment? Were some choices made to offer both low-priced and luxury options for every bride? MS: We wanted our wedding invitations to be accessible to every bride so we embraced a good, better and best strategy. We also wanted to offer a range of printing options. The designs themselves dictated how they would be printed. For instance, the most formal invitations, like our Crown design, called for a script font, gold ink and engraving whereas our more modern designs were better suited to lithography and letterpress. We thought foil stamping, which is not often used on wedding invitations, gave the traditional invitation a contemporary flair. ST: We’re also curious about the back-and-forth process with Crane. What role did they play in the design process? MS: We worked very closely with Crane, a company with more than two centuries of experience manufacturing stationery for social and business correspondence. Their talented team has a very rich and informed understanding of the marketplace. We knew we could learn a great deal from them as we developed our designs. ST: Are there any stories behind the designs in your invitation line? MS: The Crown design was inspired by a Martha Stewart Weddings invitation, and we commissioned the calligrapher John DeCollibus to create a series of motifs like the Feather Wreath and the Calligraphy Bird. Though calligraphy is a traditional art, the way the motif is placed on oversized colored stock with rounded corners makes the invitation feel fresh and modern.